William Alan Thomas’ visionary story revolves around a terminally ill convict’s attempt to escape a Mars penal colony and illicitly upload his being—all of his memories, thoughts, and dreams— into the mind of his unknowing clone. A (Philip K.) Dickian science fiction novel, it is a fascinating, cerebral exploration into the meaning of freedom. The story is set in the year 2143 as the environmentally ravaged planet is ruled by the United World States and a small band of American rebels are still trying to regain their independence. The tale initially focuses on Dominic Tessier, a star student at the Space Training Academy in British Columbia. With graduation looming, Tessier is excited to finally get his brain implants (which will make him telepathic) and become a full-fledged T-man (“transformed” man). Once a T-man, he will be linked telepathically to all other T-men as well as Raina, the godlike quantum computer that is essentially the brains behind the world government whose overarching mission is to restore Earth’s biosphere. But his life is turned upside down when he meets his secret benefactor — the person who has anonymously paid for his education and who turns out to be his parent clone. 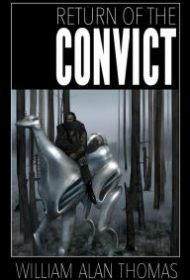 Lucas Rivera is a convict who has been exiled on Mars for decades. After discovering that he has cancer, he devises an ingenious plan to not only stay alive but to experience a second life. Unfortunately, that means Tessier will become a prisoner in his own mind when Rivera takes over his body. This is a captivating, relentlessly paced novel with well-developed characters, a fascinating backstory, richly described world-building, and a multitude of visionary imagery (i.e. the robotic dogs and horses). But perhaps the most powerful aspect is the story’s dark atmospherics and compelling underlying themes, not the least of which is the sheer unpredictability of existence. A smart, thought-provoking glimpse into the future, this novel should more than satisfy anyone who enjoys cerebral sci-fi.